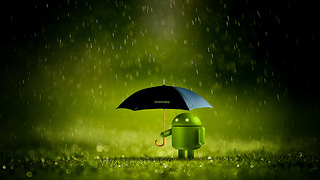 Android is now the most used mobile operating system in this planet. And Android 5/L/Lollipop is the latest version of the famous operating system. We have to say that Google has done a great job to improvise this version of Android. They not only improvised but also added a lot of new features which were not available on the past versions of Android or even any of the other operating systems till date. 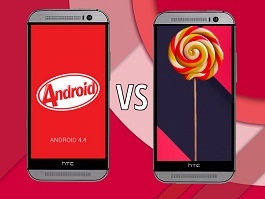 Today, we are going to show the comparison between Android 4.4/KitKat and the Android 5/Lollipop. Without further words, let’s move on. The lock screen of Android 5 has got totally changed and not to say that it has got improvised. On KitKat we had to swipe a Lock icon to unlock the screen, which was not comfortable at all. And, we could set up widgets and shortcuts on the lock screen which we could aces by swiping left or right from the lock screen. On Lollipop, we have got a totally new way to unlock the screen. You have to swipe down to unlock the screen, here we don’t have to interact with any lock icon. Thus, it is very comfortable to unlock the screen. Additionally you can swipe right from the lock screen to get to the ‘Dialer’ directly. And if you swipe to the right you will go to the ‘Camera’ directly from there. However, you can also get to those programs directly from the lock screen by swiping the “Dialer’ and ‘Camera’ icon from the left and right lower corner of the lock screen. On KitKat, there were totally no such thing existed. 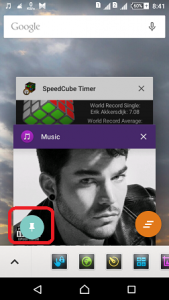 Screen pinning is a whole new feature on Android 5. It is a very innovative and productive feature. We can call it a safety feature. Using this feature, you can pin any specific screen and therefore, you cannot exit that screen/application with the help of any of the ”Recent, Home and Back” button. After you enter in any application you can pin the screen from there. You just have to tap on ‘Recent’ button then you have to tap on the Pin icon to start Screen Pinning. And, you have to tap the ”Back and Recent” key at once to stop the Screen Pinning. However, if you want to make a password protected screen pin. Then you have to set up a password for your lock screen. Then you will have to use the same password to get out of Screen Pinning. By the way, Screen Pinning might not be enabled on your device. If that is the case then you have to go to Settings> Security> Screen Pinning and turn on the feature from there. We can easily say that ”Screen Pinning” could be a very good companion of yours to protect your personal data from intruders. This feature was not available on KitKat. Lollipop supports multi-user. And, this is a very useful feature. It is a great feature to hide any type of data or files from any intruder. On Lollipop, you can easily switch to guest mode or add new users. 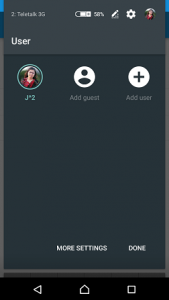 While you are on Guest mode you will find only the basic apps like calculator, Browser, messaging or calling (you can manually restrict the calling feature too). Other than the basic apps you will not find anything. So, it is very safe to give your phone to others by switching it to the Guest mode. However, you can also add new users to your phone. And, each of the users can use the phone their way. All of the users can install different apps and do different activities in their phone and those will be saved to each of the user’s profile. So, by using the multi-user support that would be very easy to share your phone to others. On KitKat if we press the ‘Recent’ button then the overview of all of the recent apps came in some boxes. And it was very annoying to find the desired app. 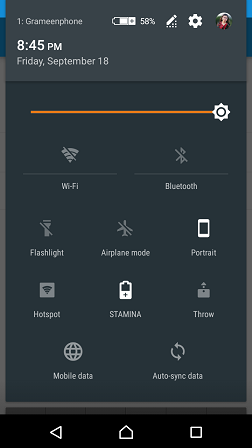 The ‘Recent’ menu on Lollipop received a major improvement. Now, you won’t find the box looking overview of the apps like KitKat. 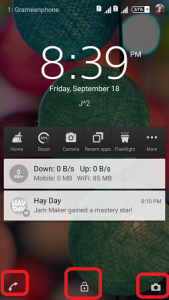 You will find all of the recent apps in a much-decorated way. It is very easy to scroll through the apps than KitKat and find your desired app. And, you can easily swipe up and down and kill any apps or all of the apps. And, the Google Search box will always be there while you are on the ‘Recent’ menu. So that you can easily search anything from there. On KitKat if you receive a phone call while you are on any app doing something like reading a PDF or watching any video, the whole screen would get covered. Literally, it was very disturbing. On lollipop, if you receive any call while using any app, the whole screen does not get covered rather it comes in a little floating widget with two options to Dismiss or Answer the call. It is really a very good feature and it does not affect your running app at all. On KitKat, the notification bar would come out with a single downward swipe. And we had to click on the tiny settings button to bring out the quick settings. Additionally we could also use double-fingered swipe to bring out the quick settings directly. However, all of them were very irritating to use. 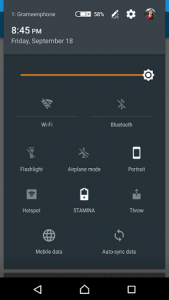 On lollipop, you have to do single downward swipe to bring out the notification bar. And, do another swipe to bring out the quick settings. It is very easy to do instead of finding the tiny settings button on the upper right corner. However, you can still do the double-fingered swipe to bring out the quick settings menu. And, if any message comes to your phone you can directly mark it as read from the notification bar without going to the main message application. 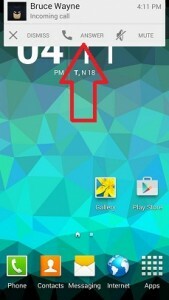 You can also access the notification bar and the quick settings menu from the Lock screen by the same way i.e. swiping down from the upper side of the lock screen. You can also check notification from the lock screen and directly go to the corresponding app by double tapping on the very notification. You can also clear notification from the lock screen by swiping left or right. And, if you swipe down on a specific notification it will give you the options to take action. And, it is a very neat and useful feature of Lollipop. This is a very attractive feature of Lollipop. 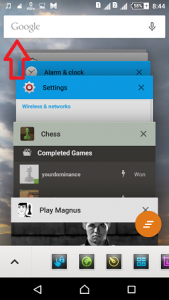 This feature will give you a very smooth experience while using Lollipop. It is a new design language. This feature works this way- on Lollipop, whenever or wherever you tap on any element of the screen, it will give you an animatic feedback. If you click on an app icon, it will open the app but with a great and attractive animation. The animation will show you that after clicking anything where the things are coming from or where it is going. 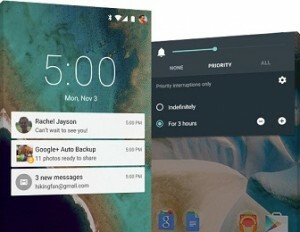 It is really a very great improvement and it makes Android Lollipop a unique operating system. And, if you use Android Lollipop, you will see and feel everything running so smooth like fluid and it is only because of the new material design. So, we can conclude by saying that it is a very nice and user-friendly interface and you will enjoy every bit of it. Lollipop has some more useful features which KitKat did not have. On settings, you will find a Battery Saver option which will help you to save battery life. You can easily customize the settings your way. You can now prioritize apps to receive notifications. If you enable the settings, then you will get only the notifications of your prioritize apps. And, if you select ‘None’ then you will be notified by any notifications even calls or alarms. You can also customize it (choose the time and apps) from the settings. Smart lock is another addition to the features of Android Lollipop. 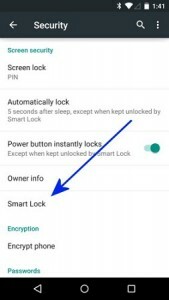 If you connect your phone to any wearable devices or any wireless devices via Bluetooth or WI-FI, then you can make that device as a trusted device. 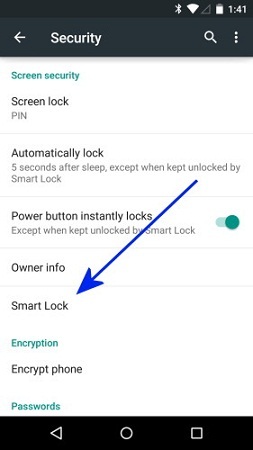 And, the phone will be automatically unlocked whenever you connect to that device. And of course, you can customize the settings furthermore. We have tried our best to show the difference between the old Android KitKat and the new Android Lollipop operating system. However, there might be more of the features and we have not covered those here. You can tell us about them on the comment section. And, you can also let us know which your favorite feature of Android 5 is.